National Farmers Market Week is upon on us – a week dedicated to the combined efforts of nature, dirt speckled hands, and eager bellies. That being said, South Bronx Farmers Market is taking over our Instagram and sharing highlights from their market in the Bronx, NY. We find the SBFM to be a culmination of everything National Farmers Market Week celebrates. 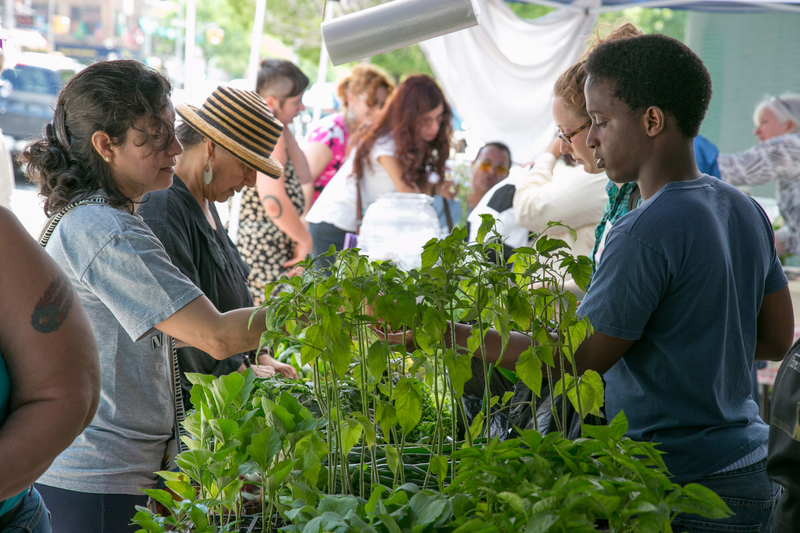 With a mission to address public health crises and providing access to nutritious, affordable, locally grown produce to the under-served South Bronx residents, this is a market that does more than just fill its lot every Saturday. The South Bronx Farmers Market was a seed which grew into fruition due to the necessity, potential, and passion behind its inception. Co-founders Lily Kesselman and Roseanne Placencia live in the borough and knew its needs for fresh, accessible produce, and a market that would be a lifeline to a hungry community. Hunger can stem from more than stomach pangs – that’s why this market is the perfect example of how to lift, to mold, and to shape a community. The SBFM accepts SNAP/EBT, offers Healthy Bucks to further customer spending, and partners with Stellar Markets to provide cooking demonstrations. Kids too can participate in cooking demonstrations and lessons, an element which trickles into further understanding and market involvement. And isn’t that what it’s all about? It’s National Farmers Market Week – so when you’re sifting through lettuce heads, finding the shiny apple that you know will crunch just right, take a moment to sample in the full flavors, the true tastes of your local market, and enjoy! Farmers Market Coalition: Tell us about SBFM. Lily Kesselman: We started our 3rd season this year and run from June to the weekend before Thanksgiving. We have one paid youth to work at the market on market day, but we now have a grant for a manager, assistant manager and for outreach. We are located in the poorest congressional district in the United States, but are located adjacent to the largest food hub in the country. Trucks pass through our community to bring produce to other neighborhoods and few, if any, stores carry locally-grown produce. We started this market to increase healthy food access to a community that has some of the worst health outcomes in the country. We run an outdoor market along a busy retail street in the South Bronx one Saturday per week. We host both rural and urban farmers – several of our farmers grow right in the South Bronx! FMC: How do you energize your community to shop at market and get involved? LK: Our volunteers have been key in promoting the market. Our volunteers surveyed almost 100 residents before we opened and we looked to those results when we selected our market dates, hours, and location as well as soliciting our farmers and growers. We have posters all around the community. This year, we have 6 light-post banners along the street and printed thousands of small flyers in Spanish & English (our community is 70% Latino) to share at community events and locations around the neighborhood. We also advertise in a community newspaper and seek neighborhood and city press. Our advise to new markets is to start with your community survey. Encourage residents to participate, as well as volunteer. Residents like to have input into what community activities are launched. Activate those volunteers! FMC: What are some challenges your market has faced? LK: Since the income of our residents is so low, we have a hard time attracting vendors. They feel there are other markets in more affluent areas that would be more profitable. We promote our vendors on social media and encourage local restaurants to shop at our market. We also participate in Health Bucks – a $2 voucher for fruits and vegetables with every $5 SNAP/EBT purchase. This program is underutilized, and we’re working hard to get the word out to help vulnerable families put more fresh food on the table. FMC: How do believe your market makes a difference? LK: The first day we opened a shopper said to one of our volunteers, “It’s about time!”. Then she said, “Thank you!” Our community-run approach activates our neighbors to participate. We have had local youth, several from an alternative-to-incarceration program volunteer each week. We encourage our youth to participate in cooking demonstrations to help enable them to cook for themselves and their families. One day, one of our youth took the cooking demo, went home and made the dish, and brought it back for us to share. It is inspiring that our youth are trying new things and working to improve their health.